The 70s started where the 60s left off. Hippy ideas and fashions were becoming part of mainstream culture. 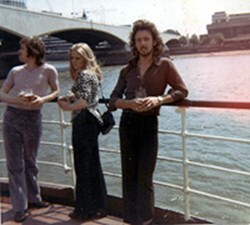 In the 70s, everyone wore flares; technological advances brought many improvements to home life, and travel abroad, became accessible to many more people. The 70s though, was also a time of economic strife and Britain's standing in the world seemed to sink to a new low. The big new luxury for many people in the 70s was colour television. Nearly all programmes in the 70s were broadcast in colour and more people were able to stretch to afford a colour set. For some the 70s is the golden era of British television with programmes such as Fawlty Towers, Whatever Happened to the Likely Lads and the colour episodes of Dad's Army. The 70s gave people a taste of a computerised future. High tech gadgets, such as pocket calculators and digital watches, became status symbols in the early years. By the end of the decade they were almost throw away items. There was also a chance to sample some primitive computer games, such as the tennis game Pong. In 1971 Britain gained decimal currency and abandoned the age old system of pounds, shillings and pence. Old people hated it and shoppers thought the change was an excuse to put up prices. Inflation in the 70s was a huge problem. Everyone talked about the cost of living. A series of strikes lead to power cuts and the Three Day Week. The 70s was not the best time for Britain's economy. Britain finally joined Europe in 1973. This was meant to improve things, but left our home market vulnerable to imports. Foreign cars became more the norm than the exception and British industry struggled to compete. Britain's standing as a sporting nation was damaged by World Cup defeat in 1970, following the historic win in 1966, however, there was worse to come when we even failed to qualify for the competition in 1978. The 70s was also the decade when we finally woke up to the health risks of smoking. People started to quit in large numbers. Keg bitter was still the nation's favourite drink, although lager was gaining ground, especially in the hot summer of 1976. Wine was not as popular in the 70s as it is today. People preferred German wines: Blue Nun was particularly well known. Another favourite was Matues Rosé from Portugal. The Summer of 1976 was one of the best ever, but the drought meant water shortages. 1976 was also a turning point for music and fashion. Punk appeared on the scene and the younger generation rejected the ideas and style of the hippy movement. In the following year, the nation celebrated the Queen's Silver Jubilee. There was at least something to be cheerful about. It also seemed that the worst of the economic problems were over. However, as the decade ended, a series of strikes, dubbed the Winter of Discontent, brought Britain to crisis point. Jim Callaghan's Labour Government lost the 1979 election to Margaret Thatcher's Conservatives. Britain had her first woman Prime Minister. Change was on the way.